by Belgin Seymenoglu. Published on 8 February 2018. 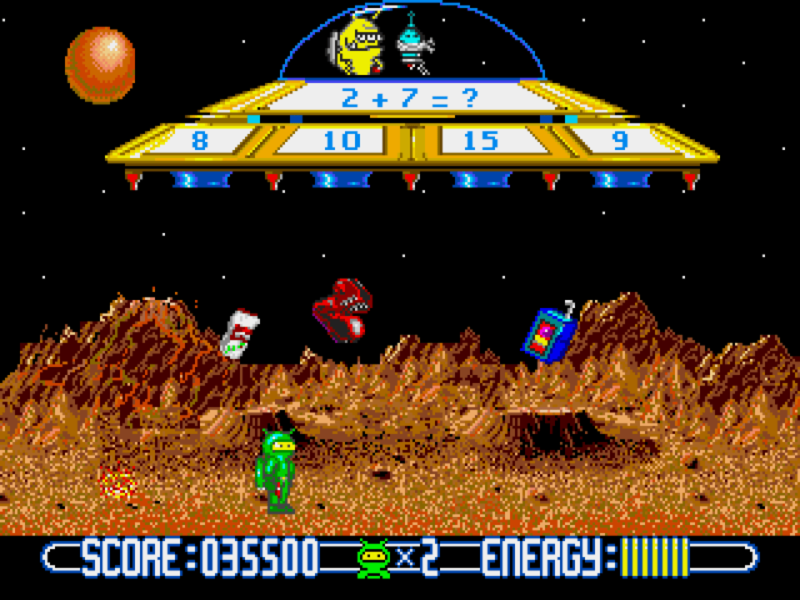 Math Blaster is a classic game many of you will have played in your childhood. But did you know it was first released in 1983 for the Apple II and the Atari 8-Bit? The original version was created by Davidson & Associates as a simple zapping game with the aim of teaching school-level maths, though it didn’t have a storyline at the time. Since then, it has been re-released countless times for various consoles and computer. 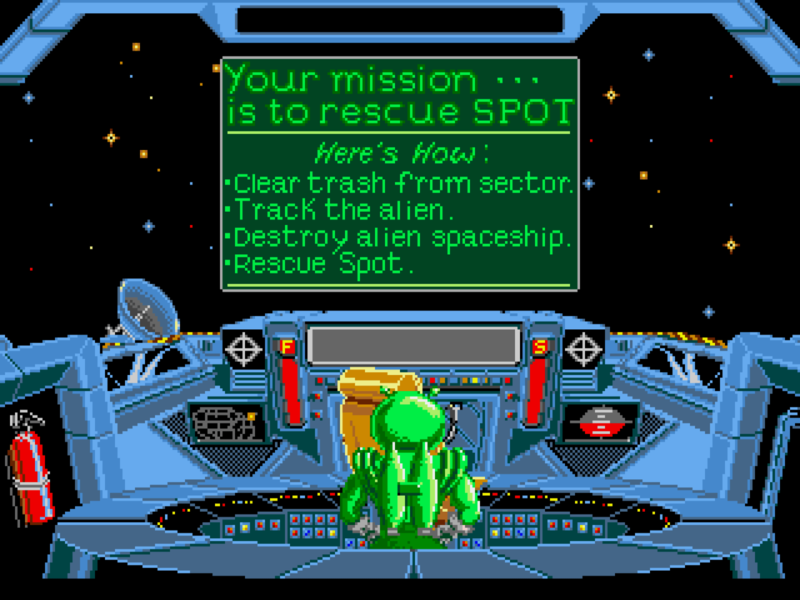 The game starts with Blasternaut asking Spot to pop outside their spacecraft and repair one of the parts in the engine. Blaster looked as if he was a father sternly telling his son to tidy up his bedroom! Spot reluctantly agrees, and starts his repair job, when all of a sudden, some yellow trash alien snatches Spot behind Blaster’s back! As soon as Blaster finds out, he calls the Galactic Commander and hatches a plan to save Spot. Apparently the first step is to…clean up the trash? I saw some trash flying my direction; each bit of junk had a different number, and only one of those numbers fits the equation on the panel, so I needed to zap the correct one. It took a while for me to get the hang of the controls, probably because I never played on a SEGA console before! But even when I figured out how to aim and shoot, it was still difficult to zap anything because you had to move the cursor using the arrow controls. All I needed in the 1998 version was a mouse – so much simpler! You also have bonus stages where you shoot asteroids to gain points. It doesn’t affect your chances of rescuing Spot, but I like the graphics for the asteroids – it’s surprisingly realistic for a game running on only 16 bits! Once the stage is over, you see the trash alien flying his spaceship into a crater on some planet, with Blaster in hot pursuit. 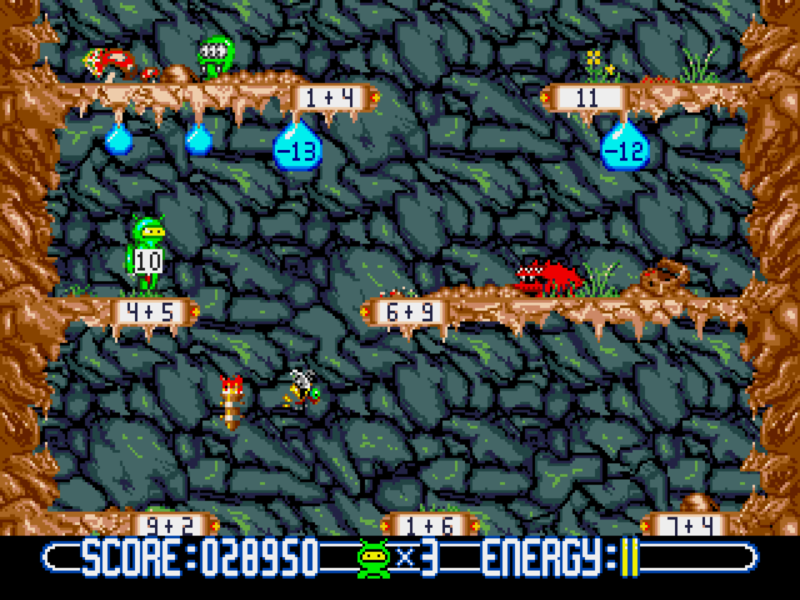 Blasternaut starts at the bottom of a series of caves with a 0 attached to his chest. As I played the 90s version, I recognised the drops of water (or whatever liquid it is) on the roofs of each ”floor” of the cave. Each drop will say something like “+2” which adds two to whatever number Blaster is carrying, or “-11” which takes eleven away instead, etc. Also, there’s a gap you fly through to reach the next floor. Playing the 1998 version didn’t prepare me for how you get past it – I saw “3+0” and “17” and tried to get 17 so I could hit a lever and open the way through (like the 1998 version). When I did that I was zapped straight away! It turned out I needed a number between 3+0 and 17 to pass. So I started to chug my way through tons of drops. The irritating part was when I wanted to take 2 away from the Blaster’s number and the “-2” drop didn’t appear, so I kept flying into lots of drops until I ended up with a number I was looking for. I passed through at last…only to fly into some bat-like creature! There were many other times I lost control while I was getting Blaster to fly – when I wanted to pass one floor, he sometimes went through several (which was a good thing, actually!) There’s a few monsters flying/walking by here and there, but I thought it was quite easy to shoot them down. It’s a bit cramped over here in the cave runner! At this point, the trash alien has carried Spot into a UFO which is hovering mid-air. The UFO has four “holes” which are like entrances. By now, you’ll have figured that to save Spot, Blaster needs to sneak in through one of the holes. Sounds easy enough, right? Wrong! Watch out for the low-flying litter! Basically there’s an equation shown on the UFO. You have to dodge the trash (as well as any loitering monsters) and fly into the port that has the correct answer. Easier said than done – I kept flying into the trash, and once I flew into the wrong hole! You can shoot at the trash to clear them, but I didn’t do much shooting myself. The first stage was NOT TOO BAD because there was less trash and I wasn’t timed, but from Stage 2 onwards I had to hurry…if I took too long, an eclipse would happen and I lost a life. Trouble was, I didn’t know about the time limit at first. Worse still, I got the fly and shoot buttons mixed up! Perhaps that was why I had difficulties controlling Blaster’s flight (again!). There came a point when I simply decided to fly straight into a hole as soon as the path was clear, which didn’t always work! I often got hit by the trash and was sent flying back to the ground. That was when I usually ran out of time, and in the end I easily lost all five lives. 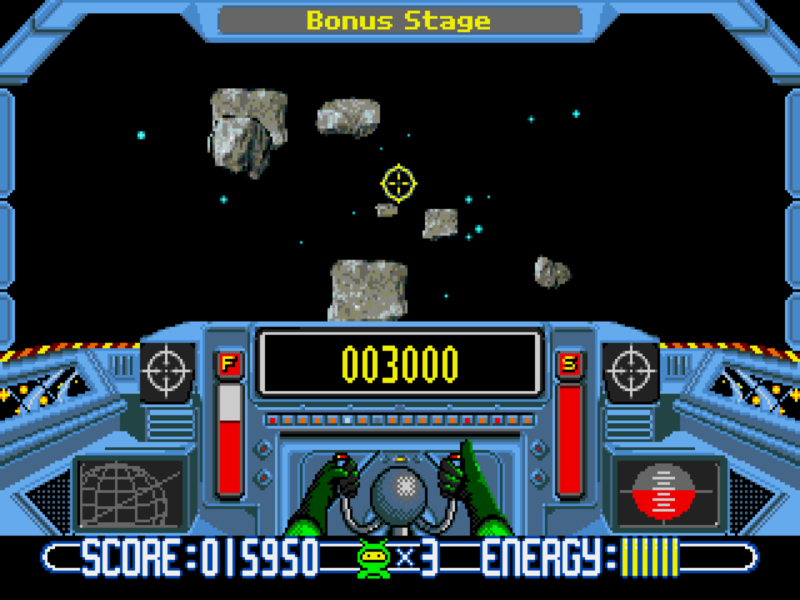 To rub the salt into the wound, I later found out that this was the final stage of the whole game – had I finished it, I could have watched Blaster save Spot and set the UFO alight! I was so close! The trash alien gets away, though. Can anyone stop that yellow fellow? The main obstacle for me was the game controls. Maybe it’s because I barely touched a games console in my entire life – the vast majority of games I played were on a PC, and the same was true when I played Math Blaster as a child, hence I’m used to saving the day with a mouse and keyboard. Also, I kept forgetting which button did what…possibly because I didn’t think of checking the controls option before starting the game! Also, the Mega Drive version seems quite short compared to the PC version of 1998, which had one more stage in the game, and the trash zapper comes up a second time. Moreover the storyline was expanded on a fair deal – the trash alien is called Gelator, and he is serving his sentence in prison. The ending has its differences, too: if you win the game, Blaster traps Gelator, sending the three-eyed criminal back where he belongs. Still, I reckon the Mega Drive version is rather nifty game for its time. 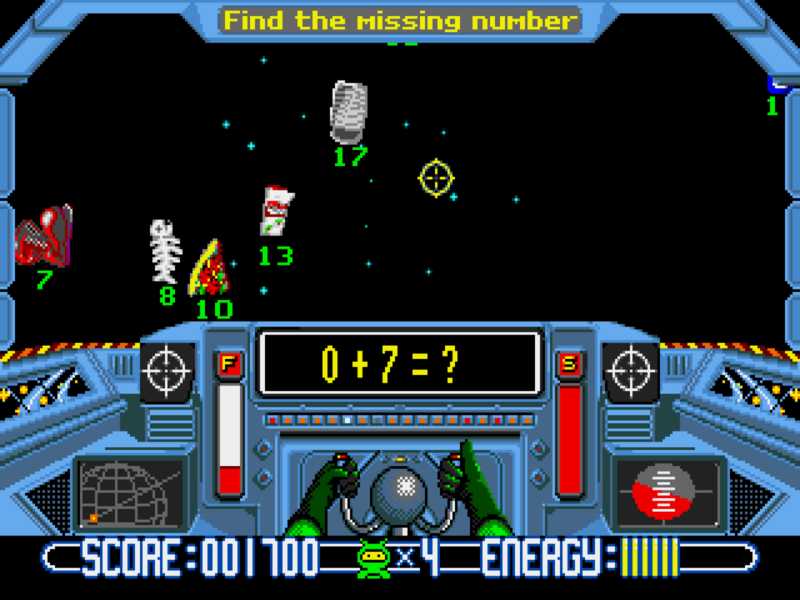 The graphics were quite impressive, I recognised Blasternaut and co., and I got my dose of Math Blaster nostalgia! Definitely going to play it again. UPDATE: I played the game a second time, and I finally managed to beat the final stage! Hurray! Belgin is a PhD student at UCL, working on population genetics. When not working, you can usually find Belgin either playing the piano or playing Math Blaster. She is pictured here standing next to her copy of Zeeman’s catastrophe machine. Donald Duck learns that there is “a lot more to mathematics than two-times-two”.